Let us be clear: force feeding constitutes an assault on human dignity. It violates a physician's ethical obligation to respect a patient's autonomy. Whoever these physicians are at Gitmo who are supervising and ordering the forced feedings ought to have their medical licenses revoked immediately. Our President's excuse is that "I don't want these individuals to die". I wonder what he would think of a physician who performed an unwanted laparotomy on a patient for colon cancer without the patient's consent and then gave the excuse that if he didn't do the surgery the patient was sure to die? Maybe we should perform CPR on all 90 year old nursing home residents during a code blue regardless of dictates from a living will because, otherwise, without the CPR the patient would die. It's an absurd, self-indulgent, self-congratulatory statement from a morally compromised President. Why doesn't he want them to die? Because he cares about them? Because of his strong moral conscience? Or is it that the scandal of mass deaths from self-starvation at a modern gulag would represent blood on his hands? But our President thinks the solution is to demand that healthcare professionals violate a core ethic by forcibly feeding these prisoners, thereby crushing the last vestige of personal autonomy they have left. Enough is enough. It's time to close this dark chapter in American history. I certainly am no fan of a great deal of what this President has done. But your diatribe ignores the self annihilation that brought those prisoners to the base in the first place. War is hell; the fallout of war can show the actual depths of hell into which man goes. 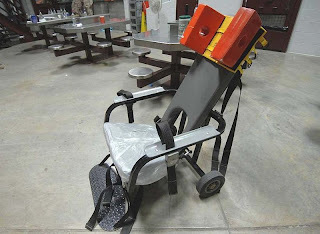 Clearly, Guantanamo is a deep circle of the inferno - but a few circles up from the fanaticism that caused its birth. Is it right? Maybe not - but its likely better than they deserve. I find it hard to have empathy or even sympathy for these prisoners "personal autonomy". They chose the path that put them into the base in the first place. Its easy judging from the stands - the President (any President) has to make some very unclear "clear cut" choices. His political motives are likely not much different than those that caused the detainees to choose the hunger strike path. Remember, they are no Ghandis!! OVER HALF of the remaining inmates have already been CLEARED for release but Obama won't execute the order because he's terrified they might go back to the middle east and seek revenge for decades of indefinite detention as newly radicalized "terrorists". Only six face charges and await military tribunals. At least 20 are "probably bad guys" but cant be charged because the evidence against them was acquired via torture. The rest reside in a state of perpetual limbo. Do yourself a favor and read about it on your own instead of mindlessly parroting government claims. Total and absolute deference to authoritarian declarations is the sign of a muddled mind, my friend. Big Brother loves you. Every man on the planet should have the 4th, 5th,& 6th amendment rights by the United States Constitution. Also the 7th so you can sue an asshat civilly if your harassed/mistreated. The BUSH ADMIN offered a bounty $$$$ for 'insurgents' dishonest people turned over innocent people they either did not like, had a beef with or were envious of. I'm no fan of Obama; who several of the Tea Party members I've met have called 'N__ger in Thief'; Congress is the body that has to close Guantanamo look at the rash of sh_t Obama got when he traded five Taliban leaders (who were locked up as war prisoners NOT terrorist) for that home schooled dimwit Bergdahl. FYI: those Taliban leaders have been locked up for about 12 years and have NO influence over, on or relevance to-with current Taliban leadership letting those guys out would be like Magic Johnson returning to play in today's MBA. Congress voted for Guantanamo, two mufti-trillion wars and appropriate funding to keep Guantanamo open at a cost of $900,000 a year per prisoner. Congress will not stop wasting our tax dollars on detention until WE THE PEOPLE vote the Pro-detention politicians out of office.